Pennsylvania Next Medicaid Expansion Domino to Fall? Pennsylvania Republican Governor Tom Corbett may be wavering on his refusal to expand Medicaid under ObamaCare’s bait-and-switch funding scheme. I don’t envy him. He’s surrounded by states like Ohio and New Jersey, whose GOP governors opted to indulge the fantasy that they can accept the federal government’s promise of full funding at face value. To his credit, Corbett isn’t allowing himself to act like there are no costs associated with agreeing to so-called “free” Medicaid expansion for the next three years. The Corbett administration has estimated that participating in the Medicaid expansion that would add 800,000 people to medical assistance would cost Pennsylvania $1 billion through 2014-15 and a total of $4.1 billion. Advocates maintain that the Medicaid expansion would pay the way for $43 billion in federal contributions, beginning with three years in which the federal government would pay 100 percent of the expansion. “Regardless of the federal government’s claims, the presumption that they will cover 100 percent of the costs of full expansion is simply not true. Regardless of any other costs under the (Affordable Care Act) that we’d have to bear, there are still IT and staffing costs, costs for additional clients coming into the system that may have been eligible before, and costs for those we believe will drop employer-based coverage,” Cronkright said. So it turns out “free” really means $1-4 billion. The simple truth about ObamaCare’s Medicaid expansion is that it establishes a one-way street toward greater federal intervention in every individual’s health care decisions. Democrats know this, and are using the “free” money trope to lure weak-willed Republicans into a federally-dominated system from which a state will not be able to extract itself. GOP governors who agree to expansion and believe that they will have the political support to simply cut off access to Medicaid when the feds pull back funding are deluding themselves. Besides, what kind of leadership is it to support welfare expansion on the condition that someone else pays for it with their debt-laden credit card? So far, Governor Corbett is standing firm in the face of tremendous opposition to fiscal sanity. Let’s hope he continues. Calif. Has $1 Trillion in Oil, But Would It Stop Govt. Spending? The overall economic benefits of opening up the Monterey shale field could reach $1 trillion. One can only imagine the impact on California’s education system, social programs, infrastructure, and even energy-tech R&D. Moreover, with that kind of revenue, Sacramento tax collections could wipe out debt and deficits. But is it really plausible that California’s big-spending political class would use the $1 trillion windfall to pay off the state’s debts and seed a rainy day fund? Call me cynical, but it seems way more likely that state spending would increase above and beyond whatever windfall comes from oil drilling. That said, I’d love for Sacramento to prove me wrong. Let the fracking begin! Larry Kudlow: “…reporter Jeffrey H. Anderson uses a Treasury Department study to chronicle the 7-Eleven presidency. In fiscal year 2012, ending September 30, the government spent nearly $11 for every $7 of revenues taken in. The exact figures are $2.5 trillion in tax revenues and $3.5 trillion in spending. In other words, it spent 44 percent more than it had coming in. Previous fiscal years look even worse: The government spent 56 percent more than revenues in fiscal year 2011 and 60 percent more in fiscal year 2010. Repeat after me: The government doesn’t have a revenue problem. It has a spending problem. Before Barack Obama, America had never seen a trillion-dollar deficit. Under Obama, we have now endured four in a row. Today, the Congressional Budget Office (CBO) announced that the deficit for fiscal 2012 totaled $1.1 trillion, after trillion-plus deficits for 2009 (which Obama falsely attributes to Bush), 2010 and 2011. Keep in mind that Obama originally promised that the deficit would be down to $557 billion this year, in addition to his infamous promise to “cut the deficit in half by the end of my first term.” Moreover, the expiration date on his all-purpose alibi of the last recession has long since passed, since that recession ended over three years ago in June 2009. 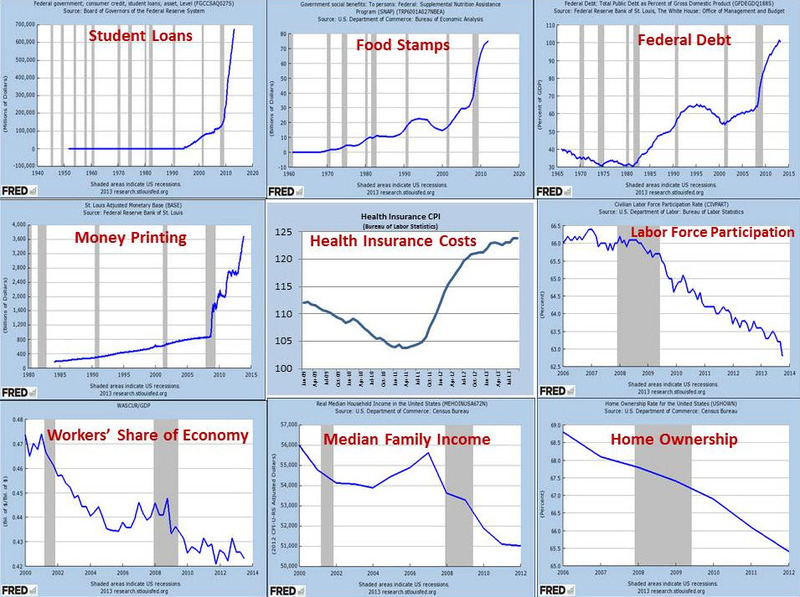 Obama and his media apologists will naturally trumpet this morning’s lackluster jobs report, yet today’s deficit announcement by the CBO provides a broader perspective on his utter, unprecedented failure as president. If Barack Obama insists on blaming Republicans in Congress for today’s economic malaise or deficits, then shouldn’t Democrats in Congress be held even more responsible? Republicans today control just one-half of Congress, whereas Democrats won overwhelming control of both houses of Congress in November 2006. That was fully two years before the financial crisis and recession (Obama’s all-purpose “mess we inherited” alibi), and our deficit stood at a miniscule $161 billion. I’ll add my voice of support to the chorus here, and say I think Paul Ryan is an inspired choice to be Mitt Romney’s running mate. One of the benefits of selecting Ryan, is that Romney gives conservatives a chance to articulate the dramatically different trend lines between the parties when it comes to reforming Medicare. 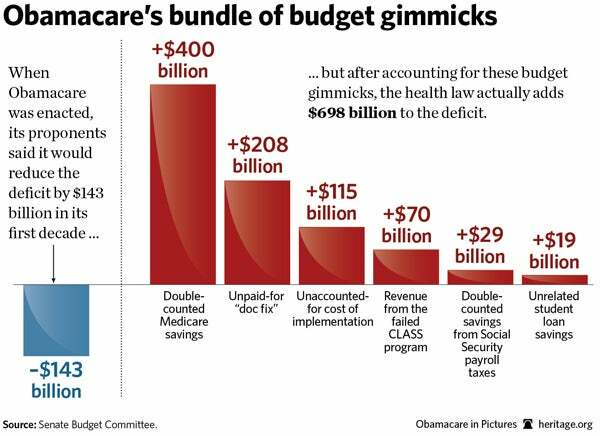 Under ObamaCare, $700 million is ripped out of an already teetering Medicare system to pay for new entitlements. By contrast, Ryan’s reform grandfathers current seniors while converting Medicare into a voucher program for younger Americans. Whereas ObamaCare creates new spending commitments with the same pile of money – thus spiking deficits – Ryan’s reform (and by extension, Romney’s) caps Medicare’s subsidy at a level that makes federal spending more sustainable over the long haul. The campaign just got serious. I’m looking forward to the next 12 weeks. But before you get too excited, the DDG-1000 program might get terminated before too long for two reasons. The second is perhaps even more problematic. Chinese Rear Admiral Zhang Zhaozhong issued a warning about the alleged capabilities of the ‘super-stealth’ DDG-1000. All he would need to overcome the ship’s technological advantages would be to swarm the vessel with several fishing boats laden with explosives. If one gets through – on a suicide mission, of course – it could literally blow up US taxpayers’ investment. Nice things cost money, and even the best technology can be laid to waste by comparatively low-tech responses. Still, public and private watch dog groups need to keep an eye on how the DDG-1000 develops. We can’t afford not to. California Governor Jerry Brown is seeking a 38,000 percent spending increase for a proposed high- speed rail system, even as he plans to raise taxes, cut state worker pay and reduce social programs to narrow a $15.7 billion deficit. The “38,000 percent” translates into a requested budget increase from $15.9 million to $6.1 billion for construction costs of California’s fantastical high-speed rail project. The kicker: all that money builds only the first 130 miles of an estimated 800 mile route from Los Angeles to San Francisco. A lot of internet ink has been spilt rightly decrying this total waste of taxpayer money. What I want to emphasize in this post is that Governor Brown’s budget request should anger liberals even more than conservatives. Can it really be true that with California’s budget deficit recently surging from $9.2 billion to more than $15.7 billion that welfare and salaries must be cut and taxes raised so that someone’s bullet train dream can come true? This is insane. If Californians – the unions included – can’t rouse themselves to kill high-speed rail for the sake of preserving food stamps and health care for the poor, the rest of the nation should wash its hands of the state and let it implode. Ending any and all spending related to the L.A.-S.F. bullet train should be done today. It’s a no-brainer. Unfortunately, that’s also true of the folks in charge of the public fisc. Yesterday, Senate Republicans blocked consideration on President Barack Obama’s so-called ‘Buffett Rule’ to impose a minimum federal income tax on some millionaires earning income on certain kinds of investments. As I discussed in my column last week, no tax authority thinks implementing the Buffett Rule will make a scintilla of difference in the federal deficit. So good riddance to a time-wasting distraction. But before we pivot to the Obama reelection campaign’s next economic inanity, let’s pause to consider what liberal support for the Buffett Rule really says about modern liberalism’s discriminatory use of the tax code. In a splendid piece published yesterday, former Reagan advisor Richard Rahn explains that the Buffett Rule only hits the type of investment income most used by entrepreneurs, and thus blocks those trying to ascend the personal wealth ladder. Even if the Buffett tax ever passes, it was crafted by members of Congress to hit few of their own. Very rich members of Congress, such as Sens. John F. Kerry and John D. Rockefeller IV, receive much of their income from tax-exempt state and local bonds and from trust funds, which largely avoid the tax. Members of Congress generally are restricted from entrepreneurial activities. So, of course, they have decided to increase the tax on entrepreneurs — the capital gains tax — which is a tax on becoming rich, not a tax on being rich. Most people, such as students, are relatively poor by government methodology when they are young but rise through the income ranks as they become more productive and experienced and then fall in relative income as they near and enter retirement, even though they may have considerable net wealth. By increasing the tax on capital gains and marginal rates, the government makes it more difficult to move into higher income brackets, thus actually reducing income-class mobility. Those who support the Buffett millionaires’ surtax as written reveal themselves either to be economically ignorant or to believe the voters are fools who will not see through their destructive games. Three cheers for the fiscal conservatives in the Senate who blocked consideration on this atrocious bill. It’s time to get beyond gimmicks, and implement policies that get America back to work without further distorting the tax code. Combine this spending monstrosity with the $787 billion stimulus bill and you’ve got nearly $1.5 trillion added to the federal deficit before any other Obama Era policy has been discussed. Lard on the costs of EPA regulations, the uncertainty of Dodd-Frank’s implementation, and the specter of all the Bush tax cuts vanishing next January and it’s no wonder the American economy is stagnant. The liberals in Washington, D.C. are spending and regulating us into oblivion. House Budget Committee Chairman Paul Ryan (R-WI) this morning is releasing the House GOP budget proposal. Ryan previews his budget in an op-ed in The Wall Street Journal here, and outlines the “choice of two futures” — the status quo of more debt and greater decline vs. a path to prosperity that includes less debt, lower taxes and inidividual opportunity — in the web video posted below. Last month, we recalled Barack Obama’s false promise in February 2009 “to cut the deficit we inherited by half by the end of my first term in office.” Instead, the nation’s deficit went from $455 billion in 2008 to $1.4 trillion in 2009, $1.3 trillion in 2010, $1.3 trillion in 2011, and now another projected $1.3 trillion for 2012. Today, the Congressional Budget Office (CBO) just announced that the February 2012 deficit of $229 billion is the single largest monthly budget deficit in American history. A $229 billion deficit would probably be close enough to make good on Obama’s promise to cut the $455 billion 2008 deficit in half as he approaches the end of his “first” term. Except that it turned out to be for one month, not one year. Fred Barnes has a terrific column in today’s Wall Street Journal explaining the origin, structure and philosophy of Paul Ryan’s Medicare reform proposal. The most intriguing paragraph explains how Ryan’s reform ideas went from minority alternative to majority consensus in just two years. But House passage alone was a milestone. When Mr. Ryan first proposed premium support in 2008, 14 House Republicans signed on as co-sponsors. But when his budget cleared the House in 2011—with Medicare reform its most controversial provision—only four of the 241 Republicans voted against it. Of the 87 GOP freshmen, only one voted no. In the Senate, all but five of the 47 Republicans declined to back Mr. Ryan’s plan. Premium support is now Republican orthodoxy. But absent a GOP landslide this fall, that’s not sufficient to win congressional approval. Besides, entitlements are best enacted on a bipartisan basis. Otherwise, they may wind up like ObamaCare—unpopular, under legal challenge, and the target of endless partisan attacks. Barnes is right that entitlement reform is best enacted on a bipartisan basis, but there’s every indication that a conservative victory this year that keeps the House and wins the Senate, supplemented with smart liberal support from the likes of Senator Ron Wyden (D-OR) and others, would certainly be considered bipartisan. According to Barnes, a handful of Democrats in the Senate and House have told Ryan they are willing to go public with their support for Medicare reform after the 2012 elections. Momentum is building for real reform of the largest deficit driver in the federal budget. This should be a motivator for every fiscal conservative to make this election the year Ryan’s reforms become law so America can get its finances in order. 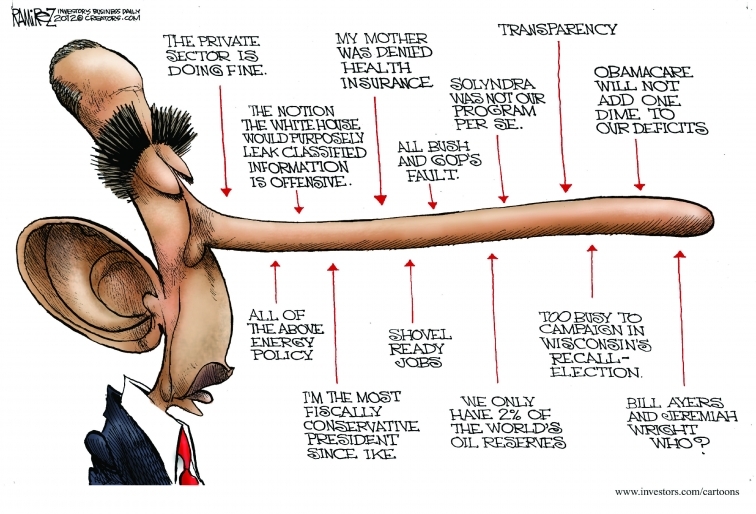 But the downsides for Mr. Obama have become clear. His partisan turn undercuts a central promise of his 2008 campaign, to rise above the rancor. And by neither embracing Bowles-Simpson nor explaining his objections and quickly offering an alternative, Mr. Obama arguably failed to show leadership on perhaps the country’s biggest problem. This month, in a New York Times/CBS News poll, 59 percent of Americans disapproved of his handling of the deficit. As of December 31, 2011, total receipts are coming in $2.6 billion less than forecasted, and expenditures are $2.6 billion more than assumed. Together, both of these components translate into a $5.2 billion reduction in cash resources. At least someone in California can still do math. Will it matter? More bad news from the Tarnished State: A memo circulated by Democratic Assembly leaders pegs California’s budget deficit for next year at $8 billion, more than double the $3.1 billion Governor Jerry Brown and legislative Democrats projected just a few months ago. In (un? )-related news, Brown’s office shut down a transparency website from the Schwarzenegger-era that made far-flung government documents easily available. Now, visitors are redirected to some of the relevant primary sources, but many others are not listed. In both cases, the price of reliable information seems to be too little, too late.